Confirmed News: ANTHE scholarship exam 2019 Release Online Now. Check ANTHE 2019 Online Registration for Aakash National Talent Hunt Exam for Class 8th, 9th 10, ANTHE 2019 Exam Date www.anthe.in. Dear students, get ready and start applying for Anthe Scholarship 2019 presented by Askash Institute for IIT aspirants. Aakash Institute conducts Aakash National Talent Hunt Exam (ANTHE) every year so as to select the eligible class 7, 8, 9, and 10 students and help them carry on their further education and to get selected and rewarded for their skills. The test is based on Science, Mathematics and Reasoning concepts and is aimed at the science scholars only. The online application process for www.aakash.ac.in/anthe Aakash National Talent Hunt Scholarship Test Class 8 9 10 has begun. Kindly, receive all the necessary details and start applying now. A student needs are appearing in class 7th, 8th, 9th, 10th and must have a distinct record in the academic years previously. There is no Age Limit for the exam. Applicants need to pay Rs. 300/- as the online application fee which is the same for all the categories. The written examination will be organized in major cities of the state listed below. Note: For Classes VIII, IX, and X, the syllabus is varying and depends upon the level from Junior to Senior. The elaborated details are accessible through the official web media provided below. The Fee waiver is as mentioned hereunder and depends up the revised structure and the highest rank achieved. This scholarship will be awarded to the top 800 qualifiers, however, for the next qualifying students, the following conditions apply. The cash reward is meant for candidates who manage to secure a spot in the top 150 qualifiers. This structure is meant for Class 8 and 9 students who are ranked from 1-to 150. This Cash reward applies to the admission takers only. Further Details are provided at the official web media. Please read the steps to register online for the examination. Details are available at ”www.aakash.ac.in” and candidates need to register online here according to the steps mentioned hereunder. The application process is the simplest one and is described here. Start applying by filling your Name, Father’s Name, Email, Contact Number, Date of Birth, Class Level, and the nearest examination centre. Complete the formality and pay the requisite fee amount to participate in the test. Dear scholars, do not miss out on this golden opportunity if you are seeking admission to IIT courses be ready to apply and check the updates about Aakash Institue Anthe Scholarship 2019 here. 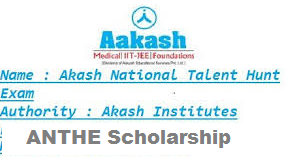 Helping our dear Contestant here we issue Aakash Institute Scholarship Test 2019 Apply online Link, Exam Date, Last Date to fill Form, etc which will be obtained from www.aakash.ac.in.